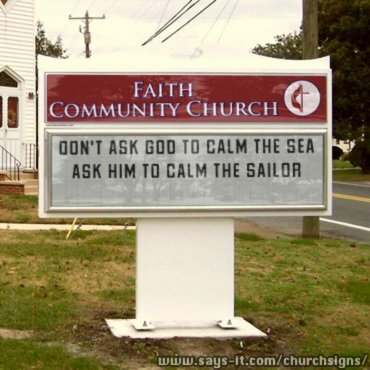 These are actual words from church signs around here. 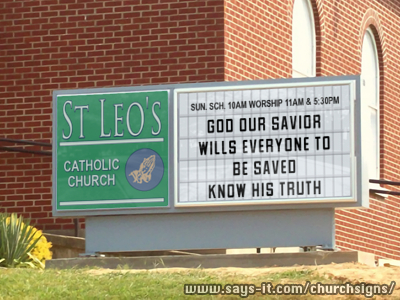 I’ve put them into the Church Sign Generator to protect their privacy. Have they ever heard of Ephesians 4:6? 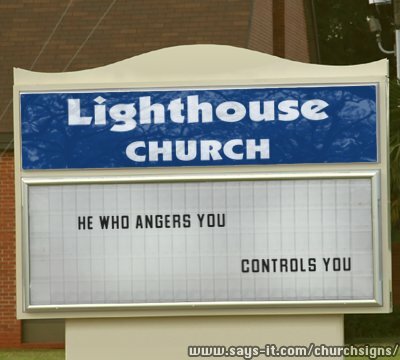 “Be angry and do not sin.” Apparently there is nothing wrong with anger, but Christianity seems to fear righteous wrath of the saints and tries to stamp out any occurrence. Bad form, Lighthouse church. Bad form. Because when things are going crazy, we don’t want someone who is on top of the situation and in charge. All we want is someone calm. Oh, yes, being calm totally takes care of all your problems when a storm shows up. Why would we ever want a calm sea when we can stand here in the middle of chaos and be calm ourselves? HAS THIS PERSON EVER HAD A STORM IN HIS LIFE?? Funny, I thought actions were what you did and character was intrinsic. Also, “character” is supposed to be a neutral term that has migrated to mean “anything good”. 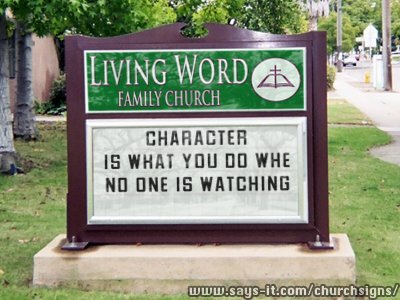 Whatever happened to “bad character,” “lazy character,” and “poor character”? So if God “wills everyone to be saved,” does that mean it has happened just like he willed the universe into existence? Poor choice of words if they meant “wants” instead. It looks like they smacked a version 1 Timothy 2:4 up there (“This is good, and it pleases God our Savior, who wants everyone to be saved and to come to the knowledge of the truth,”) and didn’t check for more current wording. I love this one. 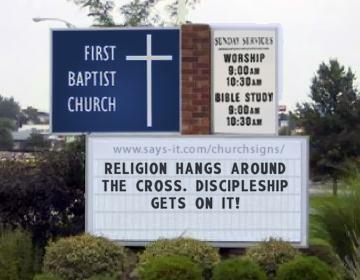 Discipleship gets on the cross? Like, you know, Jesus did?? So we can totally be like God, yeah? And be lauded for our sacrificial natures! What’s that? There’s a verse about being glorified by men and how that’s all the reward we’ll get? Well, shoot. This entry was posted in Truth is Stranger Than Fiction, Uncategorized and tagged Everyone Would Be Happy If Only They Listened to Me, Friday Five, Pointing Out Inconsistencies Doesn't Mean I'm the Enemy by Rommie. Bookmark the permalink.